How likely are you to recommend our services to others ? Thank you for the great laughing yoga session. I believe everybody enjoyed it. I have to say it was quite funny to watch as well 🙂 We will definitely consider you for our next events in London ! Sarah ( Yoga Teacher ) I really enjoyed your laughter yoga group at the kindness offensive. I felt as a facilitator you are welcoming and have an infectious laugh! The session was fun and definitely involved lots of real laughter! How can I describe laughter yoga? To me it is an invaluable happiness tool. I started laughter yoga about a year ago and have been a strict devotee since then. Every session brings me much joy and lifts my spirits by allowing me to laugh and play and regress back to childhood silliness. I have bipolar and have found laughter yoga a fabulous tool to lift my spirits when I’m feeling really down. Even when I feel fine, laughter yoga lifts you up and brings peace and calmness of mind. Odette is a fabulous leader whose laughter and joy for her work is infectious. 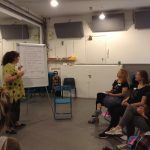 Any other comments on how you are feeling after the workshop ? I buzzed off the instructors energy and her laughter is infectious. She presented the class clearly and effectively. Include laws that trigger emotions ? 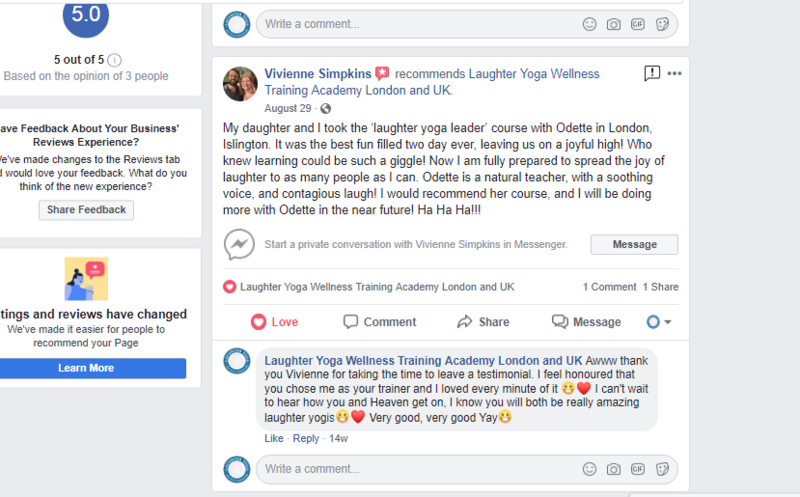 Review from Paola after attending our Laughter Yoga Leader training and going on to do some work for us!